Cedar Waxwings are easily identified by their sleek grey-brown plumage, crested head, pale yellow belly and black eye mask. A yellow tipped tail and red wax-like wing tips are further bulls-eye clues to their identity. They travel in small flocks and are year round residents of our region. Brushy areas, forests and orchards are their preferred habitat. Cedar Waxwings are common year round on the grounds of MD Nursery where they have plenty of food and cover. Fruit is their primary diet and a flock can quickly devour the fruit of an entire tree to the woe or delight of its owner. In winter, they continue to dine on the fruit that is frozen and dried on trees and shrubs. 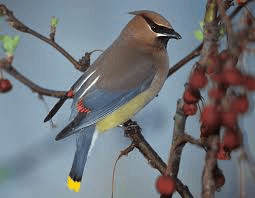 Cedar Waxwings are not readily attracted to bird feeders but you can entice these beautiful birds (and many others!) by planting their favorite trees and shrubs on your property. Viburnum, Mountain Ash, Crabapples, Honeysuckle bushes and cherries are all good choices to attract Cedar Waxwings. When feeding, they will flock to their food source and then return to other trees for cover and to rest. A variety of fruiting and non-fruiting trees and shrubs will provide valuable year-round habitat for these delightful birds.